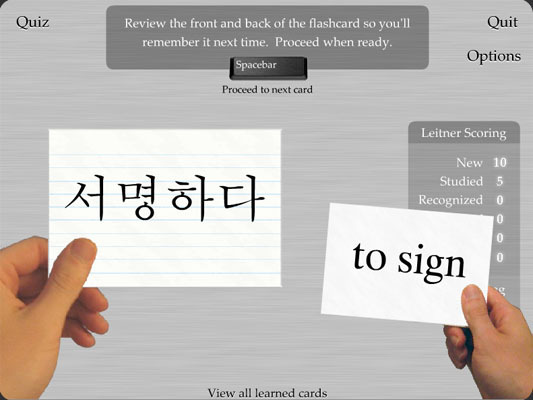 Flash My Brain - Raise your Korean level with Flash My Brain flash card learning. 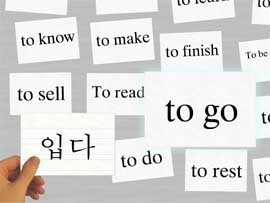 Raise your Korean level with Flash My Brain flash card learning. Flash My Brain is one of the few online systems that happily accepts Korean input. It even offers resources to help you figure out Korean input on your computer. It's simple to make Korean flash cards in Flash My Brain -- it's even simpler to print them out. Flash My Brain creates beautiful hangul flash cards, but it doesn't stop there. Upload mp3s of pronunciations to easily create talking flash cards. Flash My Brain is the ultimate tool for learning Korean through flash cards. Buy Flash My Brain for $29.95 and use Flash My Brain to achieve new levels of mastery in Korean. 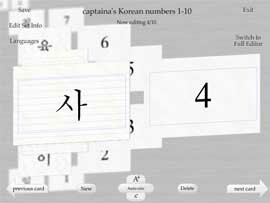 Korean flash cards work 100% with Flash My Brain's learning framework. Positive reinforcement based learning encourages retaining the knowledge as long as possible, and mini-games make learning Korean fun!